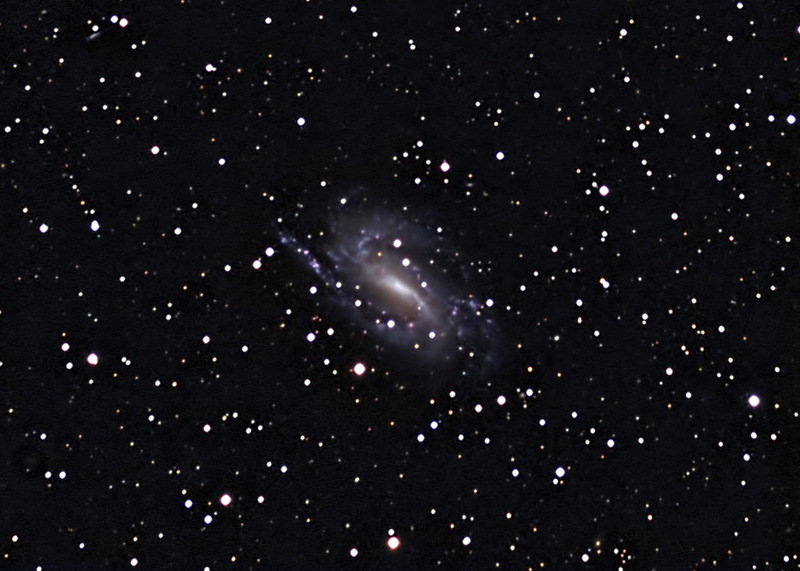 NGC 925 is a barred spiral galaxy that is viewed nearly face-on. The arms are flocculent, referring to their asymmetric nature. It is possible that this was caused by interaction with a nearby galaxy in the past. There are many star-forming regions in the arms. The numerous, newly formed stars give the arms a blue hue. Images were focused, captured, reduced, aligned, and combined in CCDSoft. The composite image was adusted in Photoshop. Vignetting was controlled with XTerminator. Noise was reduced with Topaz DeNoise. Shot from my backyard observatory in southeastern Minnesota on 10/26/14. Temp: 20F; seeing was average. .